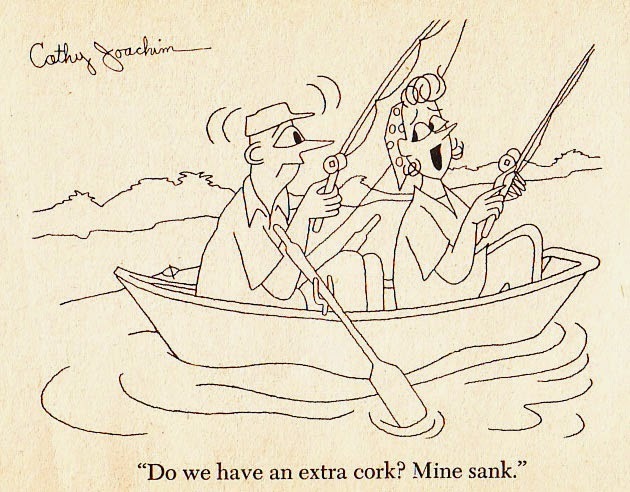 Veteran New Yorker cartoonist Joseph Farris has died. He was 90 years old. His death was announced by his daughter on his Facebook page. 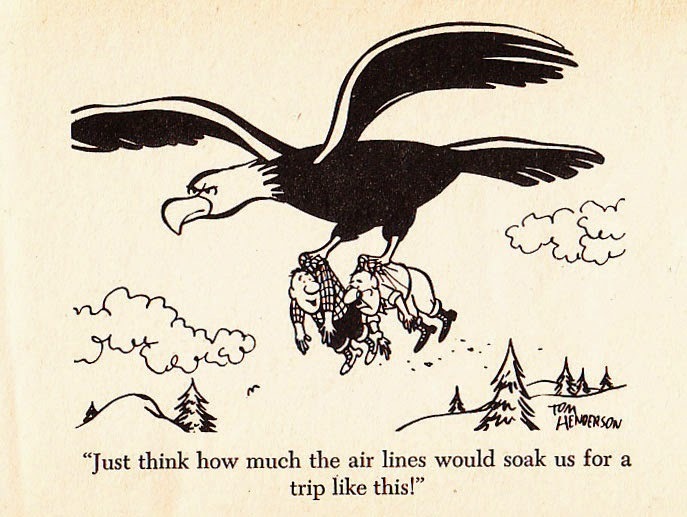 A World War II veteran, Joe began cartooning under the tutelige of the New Yorker's Richard Taylor. Taylor, like him, lived in Connecticut. 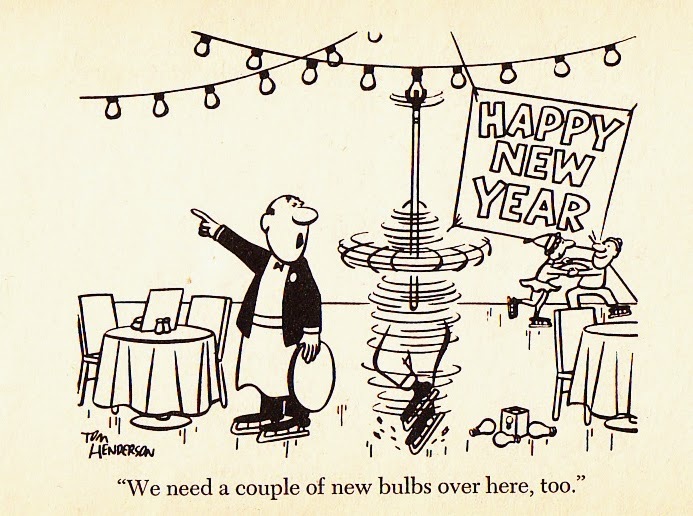 Farris' cartoons appeared everywhere, with his first cartoon appearing in the New Yorker in 1957. 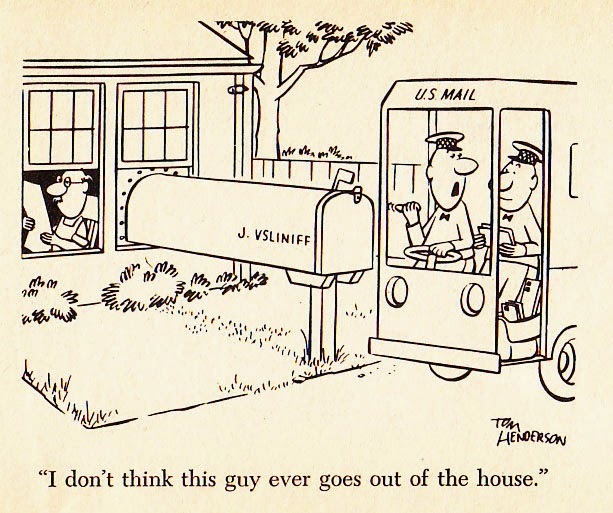 He would go on to sell the magazine nearly 300 cartoons, and draw a couple of covers as well. 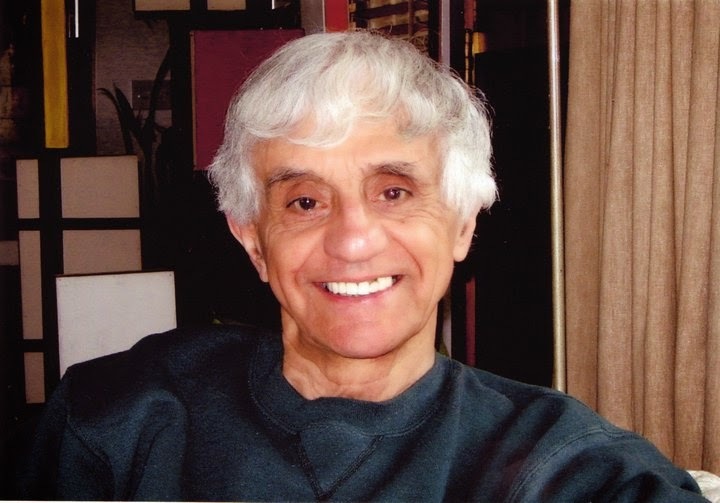 He had a couple of collections of his work (UFO - HO HO in 1968 and JUST A COG IN THW WHEEL in 1989), as well as a nonfiction hardcover A SOLDIER'S STORY(2011) featuring his illustrated letters home from the war front. I knew Joe through attending the "look day" at the New Yorker for years. He was a very kind, quiet fellow who was generous with a big smile. 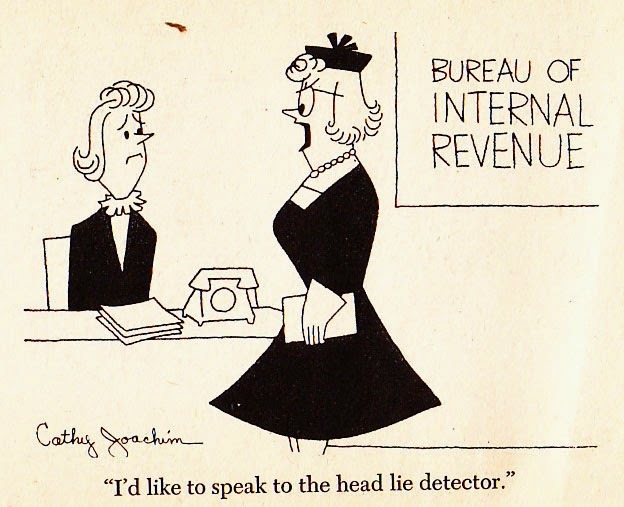 It was only after meeting him that I began to notice that, like the good, hard working golden age gag cartoonist that he was, the man had a cartoon in every market that I saw: Reader's Digest, Harvard Business Review, The Chronicle of Higher Education, Funny Times, and so many more. 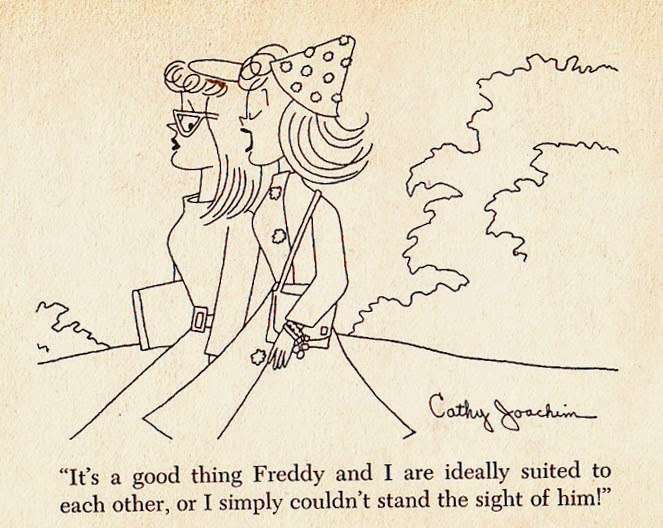 Not just that, I would buy second-hand cartoon books like BEST CARTOONS OF THE YEAR and there he was, all the time. Out of the blue, four years ago, he mailed me a copy of his nonfiction book A SOLDIER'S SCRAPBOOK. So very kind of him. 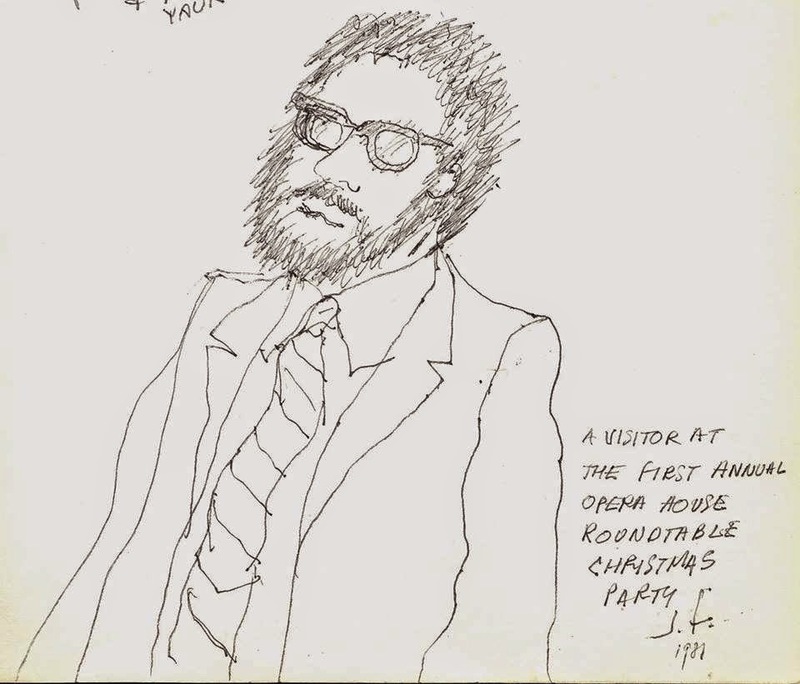 "I stipulate that this is not a great likeness or up to Joe Farris's usual standard -- he later said so -- but this WAS drawn at a Christmas party, far into the night. 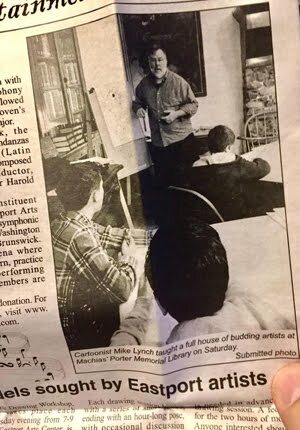 For decades it has been a tradition for cartoonists in the Bethel/Ridgefield area of Connecticut to meet (at least) weekly for lunch. For a while it was the Opera restaurant on the towns' border. I lived in Bethel, then Westport, then Weston, for years, and would spend one afternoon a week so engaged with Ron Goulart, Jerry Marcus, Orlando Busino, Bob Weber, Gill Fox, Jack Berrill, others. 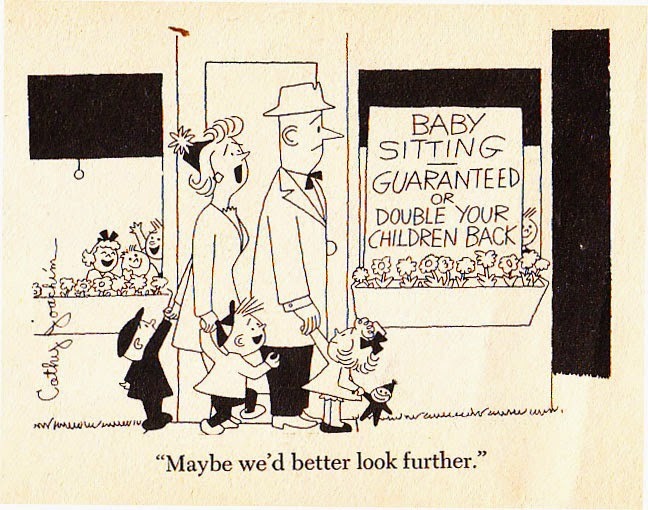 Sometimes we would run into Bob Kraus or William Steig. Happy days. One year Joe offered to host an evening convocation of the "roundtable" at his house, with spouses invited and Christmas as the excuse. 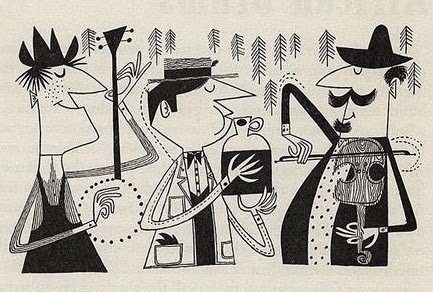 He managed to draw this caricature of me, as I say, well into the evening's festivities. I miss those days; I miss Joe." Bethel New Times: "Famed Bethel cartoonist remembered as 'selfless person'"
SMICK is a new children's picture book by Doreen Cronin and illustrated by my friend Juana Medina. Penguin Books has put out this short animated promo for the book today. It's scheduled to be out in bookstores and libraries next month. 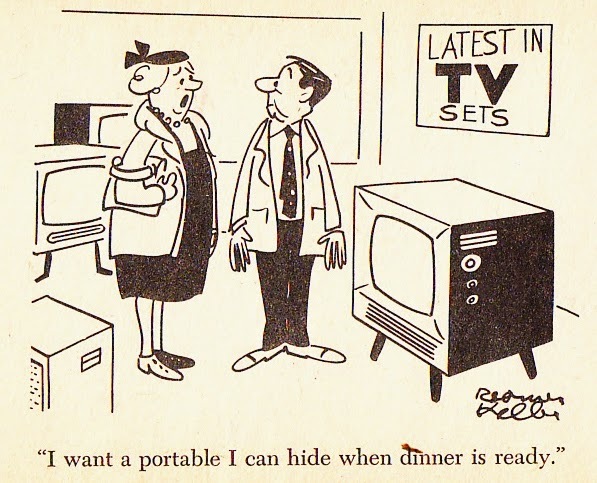 More gag cartoons from fifty years ago from the CARTOONS-OF-THE-MONTH book. 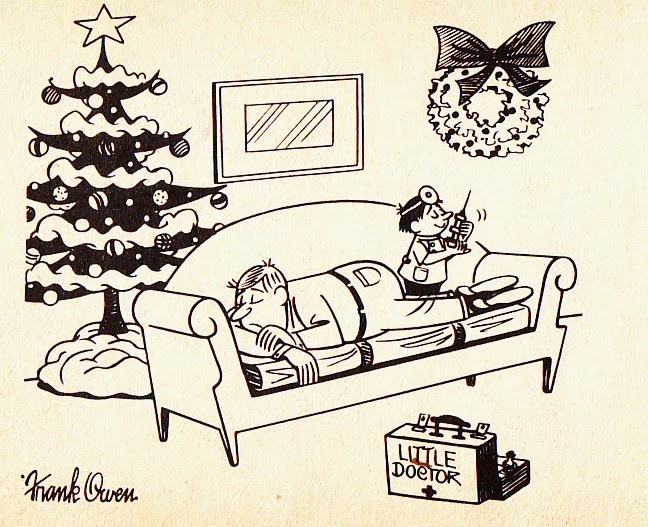 It's copyright 1965 by the Scholastic Magazine. The first part is here. 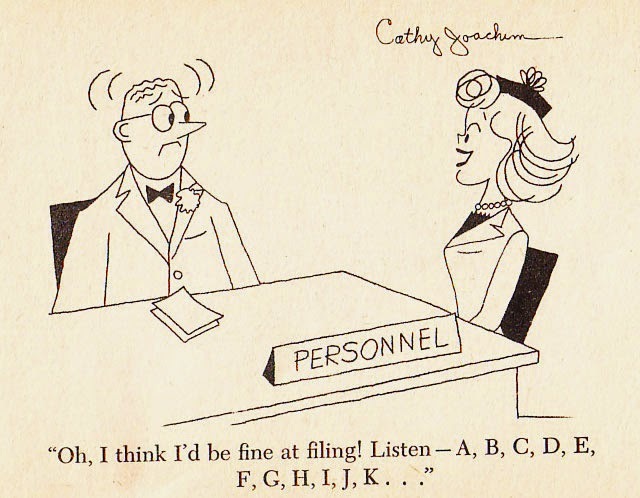 These panel cartoons may have been culled from the syndicated feature "Today's Laugh" which had a run of over two decades (1948–1973). It was originated by Tom Henderson and William King. 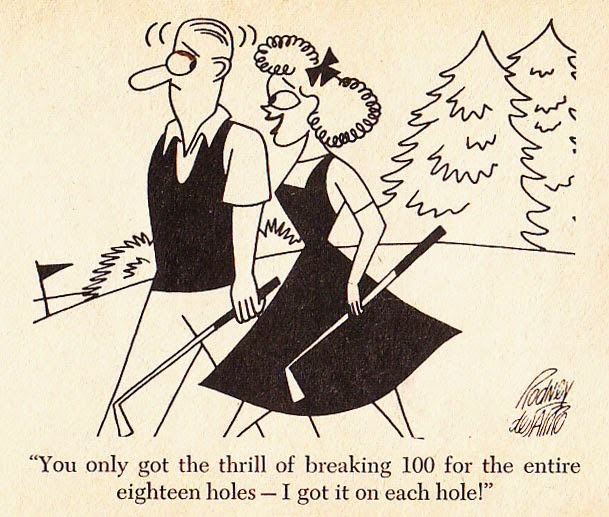 Later on, gag cartoon stalwarts like Jeff Machamer, Frank Owen, Rodney de Sarro, Reamer Keller, Jeff Keate, Cathy Joachim, Bill Yates, Joe Zeis and Betty Swords joined the revolving team of featured cartoonists. 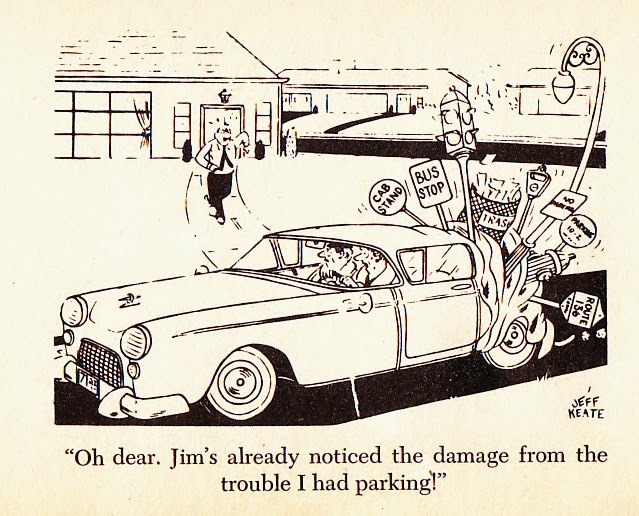 Cliff Roberts draws amazing midcentury modern cartoon art for THE FIRST BOOK OF JAZZ! 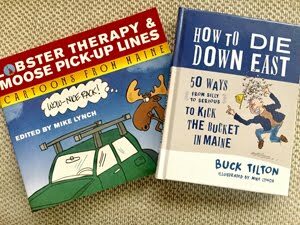 "A gaggle of giggles especially selected for teen-agers!" 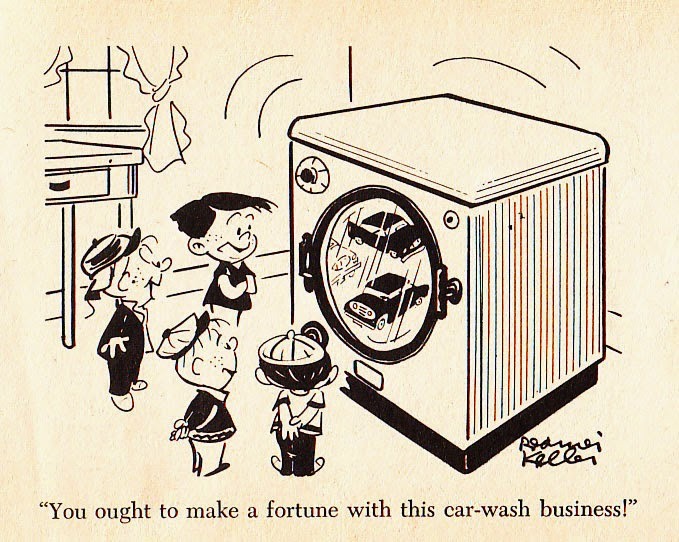 reads the promo copy for CARTOONS-OF-THE-MONTH, a small book (it was pocket size) that sold for 35 cents back in 1965 and is copyright that year by the Scholastic Magazines people. 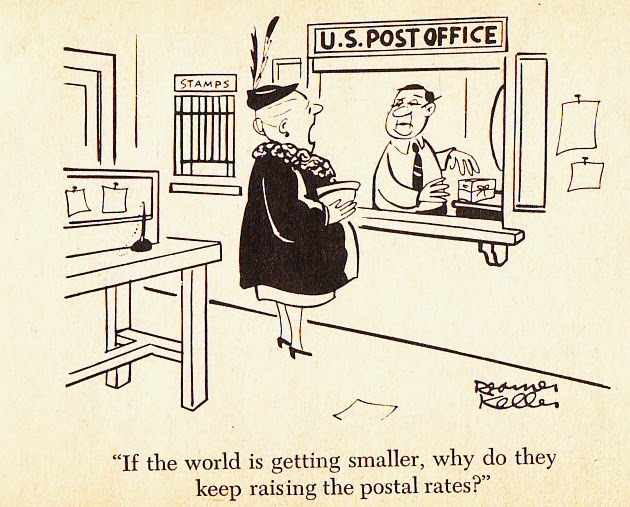 "We took our pick from hundreds of hilarious cartoons in the field of Cartoons-of-the-Month -- and organization which features some of America's leading cartoonists. 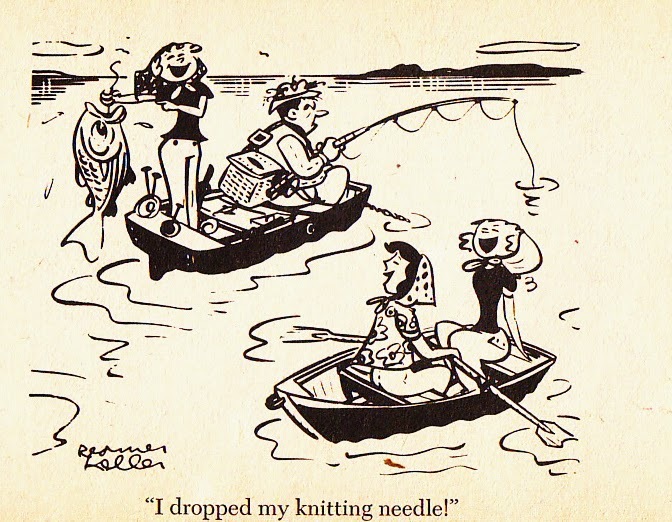 You'll recognize the work of those humor artists -- you've seen their work in the pages of Look, McCall's, This Week, The Saturday Evening Post, and many other of your favorite magazines. "Read 'em and weep … with laughter!" My guess is that this was offered to school kids as part of the Scholastic Book Club. We had that back in Iowa. Every month your could order a book or two from this small catalog from Scholastic. There are six cartoonists in the book: Rodney DeSarro, Tom Henderson, Jeff Keate, Reamer Keller, Cathy Joachim and Frank Owen. Some of these are creaky gags. The hillbilly humor on the cover is a tell to its 50 year old age. And you get a healthy dose of other kids of gags: desert island, science fiction, teenagers, gossiping wives, clueless husbands, devious children, etc. Frank Owen. The gag line was partially cut off in the printing and even more cut off when I scanned this in. 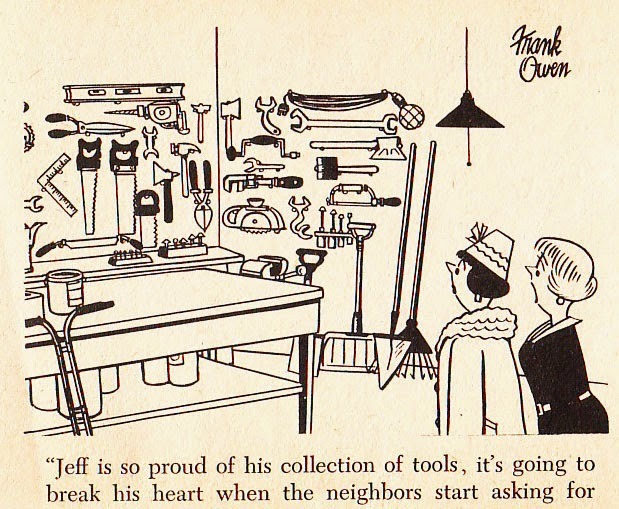 The complete line is "Jeff is so proud of hie collection of tools, it's going to break his heart when the neighbors start asking for them back!" No signature on this one. Frank Owen? 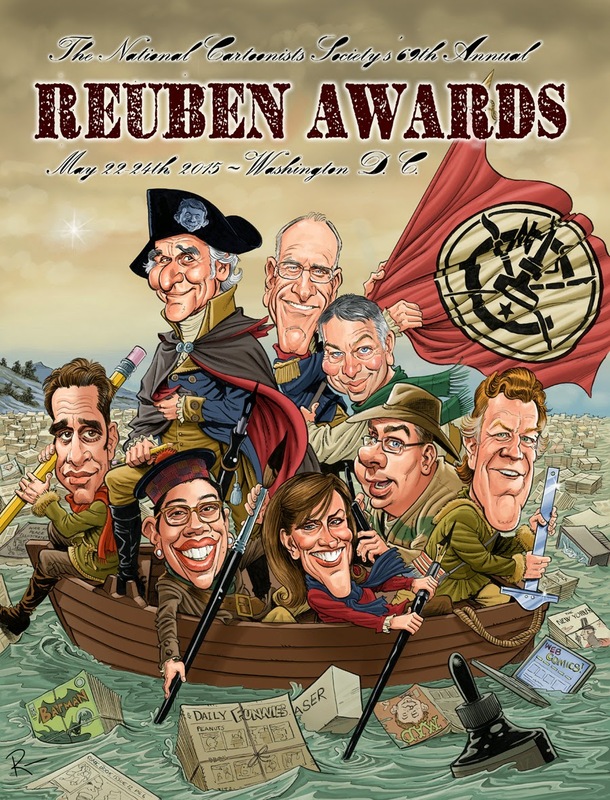 National Cartoonists Society President Tom Richmond has announced, and drawn the caricatures of, the presenters at the 2015 Reuben Awards. The annual NCS weekend will be held in Washington, DC, from May 22nd to the 24th. 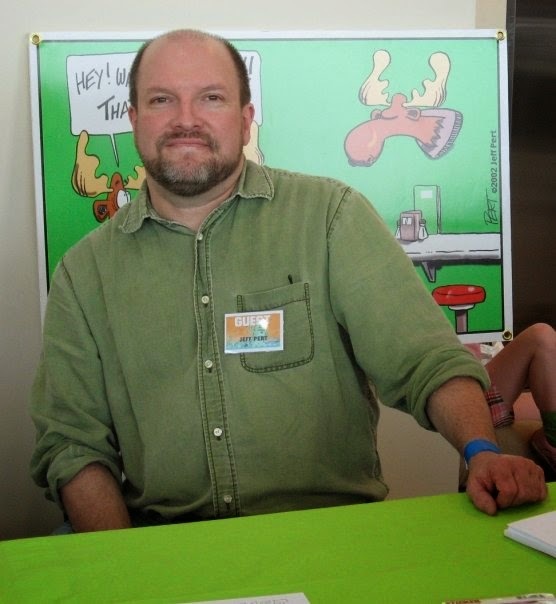 My friend, the Maine cartoonist Jeff Pert, who died unexpectedly in April, will have a memorial fund in his name. Jeff had told me about the summer of 2006, when he was selected to attend the Odyssey Writing Workshop in New Hampshire. It was an immersion into a world of creativity that made an impact on him. The Jeff Pert Memorial Fund is now accepting donations to help finance the appearance of a guest lecturer at a future Odyssey Writing Workshop. Donations to the fund can be made at sff.net/odyssey/donations.html, or by mail: Odyssey, P.O. Box 75, Mont Vernon, N.H., 03057. 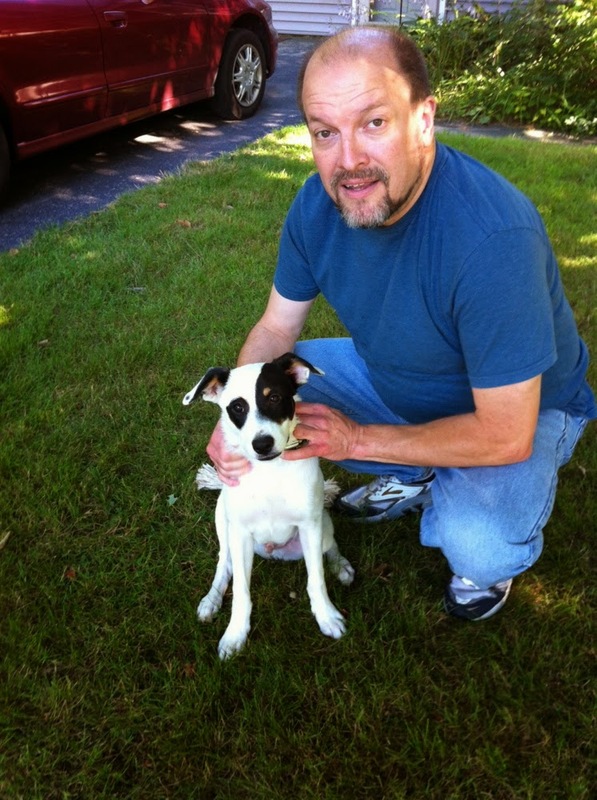 Specify that the donation should go to the Jeff Pert Memorial Fund. My thanks to Jon Pert, Jeff's brother, for letting me know about this. 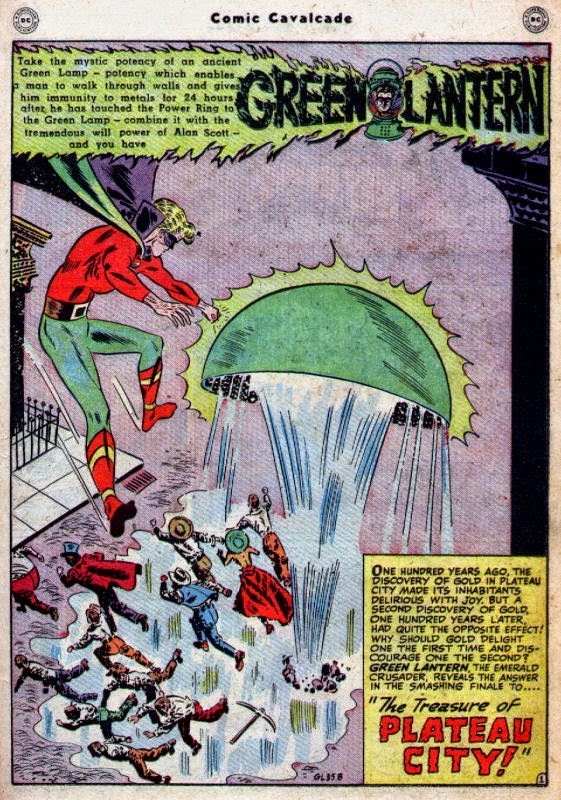 Ger Apeldoorn shares three early DC Comics Green Lantern stories that a young Alex Toth drew. 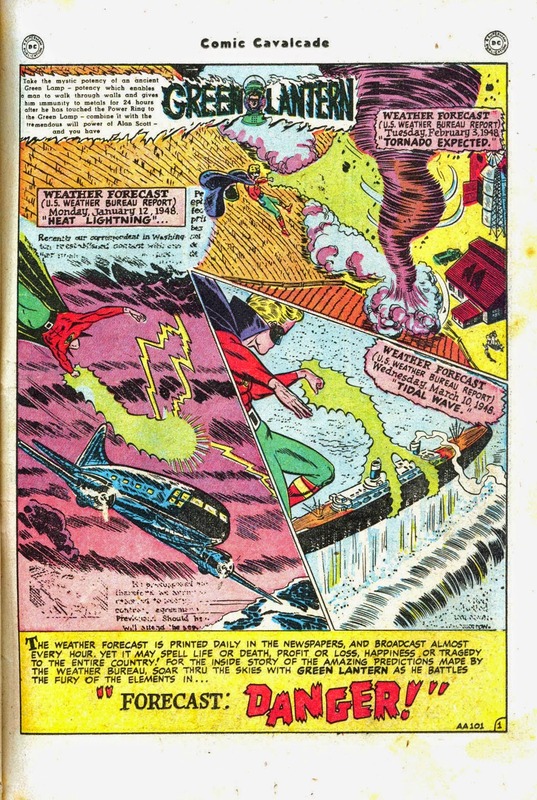 Although they are steeped in the DC house style, you can see his stylistic evolution, just with these three splash pages. Ger has all three complete stories. 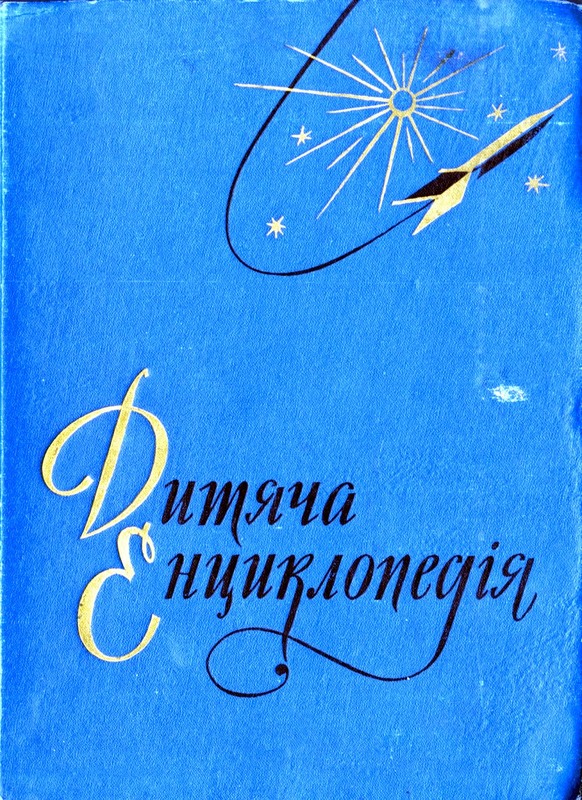 If you want to see some terrific drawings from the golden age of Soviet space flight, take a look at this Soviet Encyclopedia from the Dreams of Space blog today. 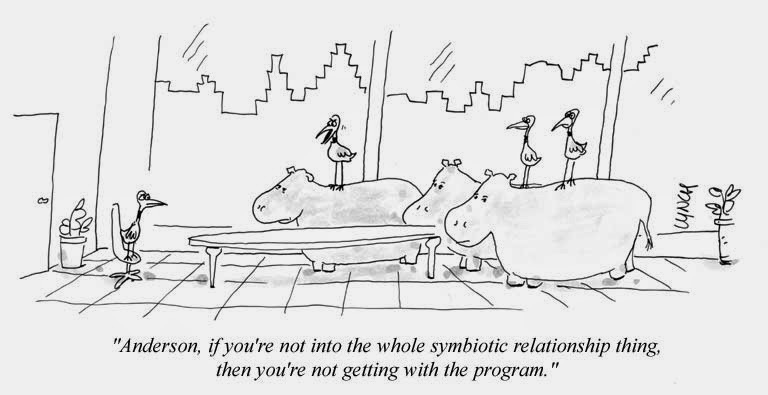 then you're not getting with the program." I wish to add your cartoon to a Powerpoint presentation. Hey, that's great that you would like to use my cartoon. My fee is $20 per image, per presentation. I accept Paypal and credit cards. Unfortunately I shall not use your cartoon if it means paying for it. I thought I would just try and do things by the copyright book. Thanks anyway. No hard feelings. I'm sure neither one of us can afford to give away his/her professional work. A friend -- a fellow cartoonist friend -- quipped, Yeah, they wanted to ask you for it before they stole it. Is taking a cartoon stealing? Yes. A cartoon has value. 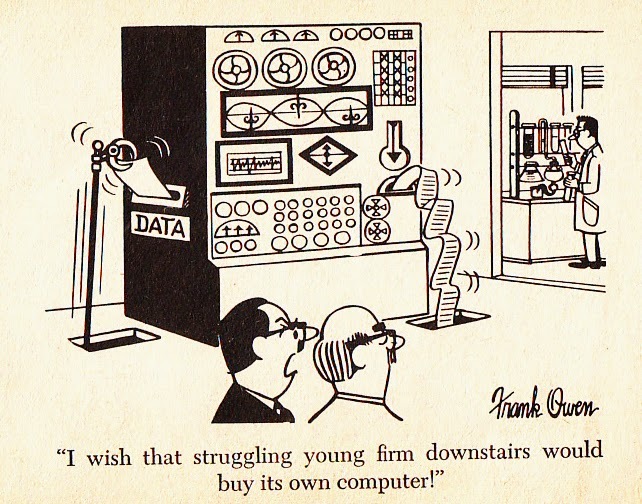 A cartoon is called "intellectual property." Composer Tom Green, writing for First Drafts - The Prospect Magazine Blog, writes about the "Music industry in crisis: you gets what you pays for:"
People who like Tom's music are just not that into his wallet concerns. Remember some years ago so many of those free alt-weekly papers were getting rid of ALL of their comics? At the City Paper, they got rid all of them except one: a cartoon titled Dirtfarm by Ben Claassen. How did it escape the fate of the others? Well, it's sweet to have those feelings for a business --but family should not let you starve, Ben. When fans who like your work, and the companies that buy your work, all ask you to work for free. What do you do? When I get an email telling me "I shall not use your cartoon if it means paying for it," I remind myself that I'm fortunate that, for now, I have corporate clients who do pay. I'm also fortunate that I do not have children, a big house, 2 cars or outstanding medical bills (for now). My plan: I will continue to persist in finding new markets, and proactively getting my work out there (and not doing business with people who want me to work for exposure). Consumers will continue to have art and music to consume, but more and more, it will be produced part-time; by people with day jobs. NOTE: As of this time, the Prospect blog is down. -- Edited from a February 13, 2009 blog entry. 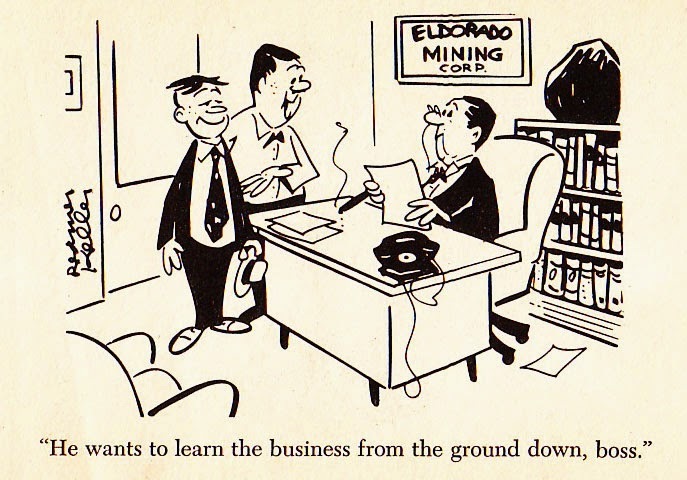 You may have heard of the Billy Ireland Cartoon Library and Museum in Columbus, OH -- but who was Billy Ireland? Lucy Caswell talks about Billy Ireland's art and impact while drawing "The Passing Parade" for the Columbus Post Dispatch. 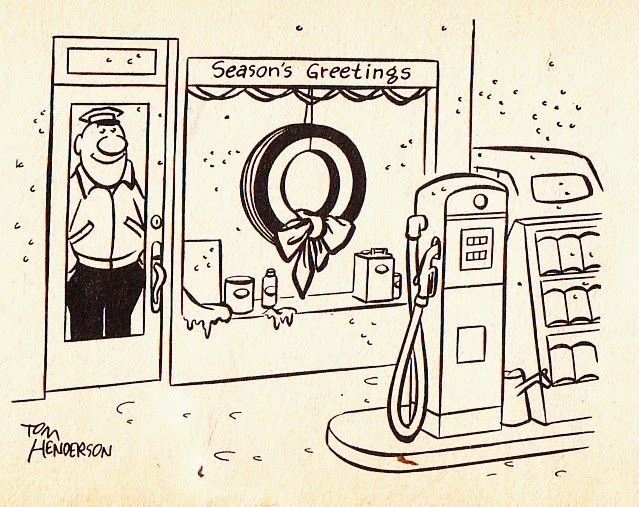 There are lots of great shots of Ireland's cartoons. Bob Hunter, the Sports Cartoonist for the Post Dispatch, talks as well. It runs about 4 minutes and was produced by Woodland Park Films. 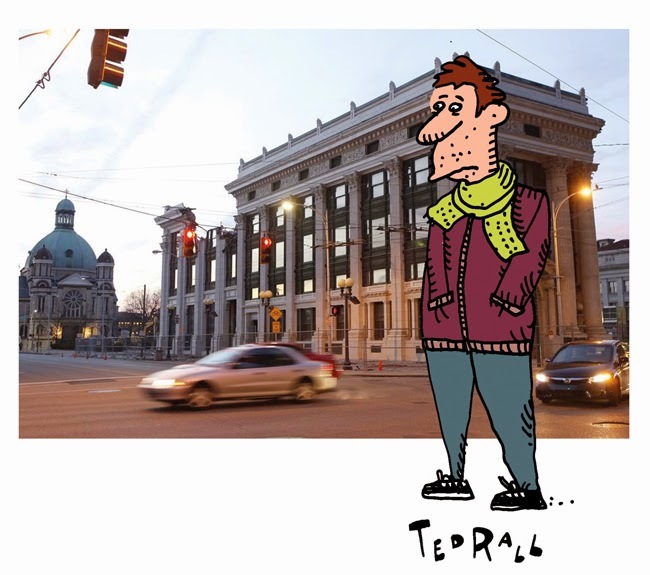 Ted Rall: "The Gutting of Dayton: Why My City Is Gone"
Ted Rall tells a chilling, true story of his hometown, Dayton, in this terrific piece of graphic journalism called "The Gutting of Dayton: Why My City Is Gone" for A New Domain. George DuPre was, for a time, famous. Then he was infamous. Wartime writer Quentin Reynolds went up to Canada, to write about this amazing young man for the Reader's Digest. He liked the guy a lot. He phoned his editor Bennett Cerf, telling him he thought there was enough material there for a book in addition to the Digest article. 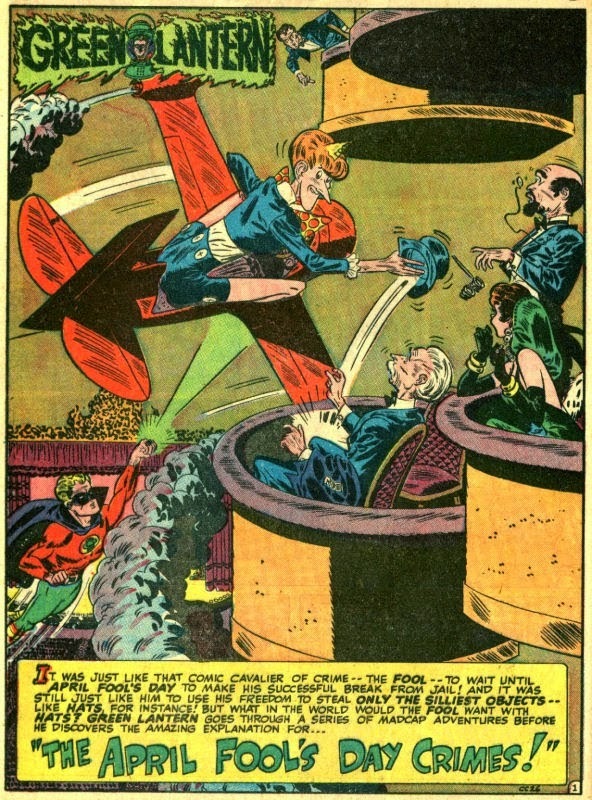 Bennett gave Reynolds the green light to write Dupre's story. The book was called THE MAN WHO WOULDN'T TALK. "The book got good reviews and was a substantial success. "Then one night when we were having dinner up at Mount Kisco, I had a long-distance call. The editor of the Calgary Herald was on the phone. I said to Phyllis [Cerf's wife], 'What the dickens does the editor of the Calgary Herald want in my young life?' I soon found out! He said, 'I'm afraid I have some bad news for you, Mr. Cerf. Your Mr. DuPre has just collapsed and confessed that his entire story is a hoax. There isn't a word of truth in it. His adventures are things he read in various news stories and spy magazines. He spent the entire war in England and then in Canada and never got to France at all. The business of his being captured and tortured and the underground stuff was just his imagination. He couldn't stand the strain any longer, his conscience was bothering him. He is a nice little man and he didn't realize his deception was going to be blown up to these dimensions. He was just romancing a bit and suddenly found himself a national hero! We're printing the whole story tomorrow morning, and I thought I'd give you a little advance notice.'" I was thinking about this situation when I heard about Alex Malarky. You know Alex Malarky, or at least you heard about him: he's the 6 year old boy who was in a coma for two months after a car crash and who then, fortunately, woke up. He was a quadriplegic, but he was alive. And Alex told his parents that he had just come back from heaven. Alex and his dad, Kevin Malarky, cowrote a best seller about it called THE BOY WHO CAME BACK FROM HEAVEN. So, what does a publisher do when their nonfiction book suddenly becomes fiction? Like all people who know history, we know that there is nothing new in the world. These things have happened before. 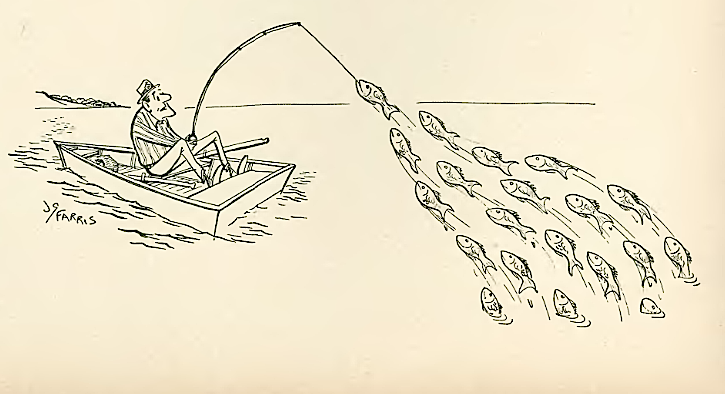 In the case of that "nice little man" DuPre, who had lied and inadvertently showed up the Reader's Digest and Quentin Reynolds and Bennett Cerf as total dupes, it was the same situation: what do you do? Tyndale House and Random House handled it differently. It worked like a charm. The press was delighted with the whole story and played it up, as I had hoped, as a harmless deception. Nobody was really hurt. The interesting thing is that the book sold about five times as well after the exposure and it did before. "... It's another example of how you can laugh things off. If we had gone into a frenzy, we'd have made fools of ourselves. This way, everyone laughed with us. Quent laughed right along with us too, but he continued to say, 'He's a great guy, despite everything.'" AT RANDOM, THE REMINISCENCES OF BENNETT CERF by Bennett Cerf is copyright 1977 Random House. Today's must watch! This spans about 50 years of BATMAN TV and movie soundtrack music. Plus: you get three batmobiles. What's not to LOVE?!?!?! Batman Evolution from ThePianoGuys on Vimeo. 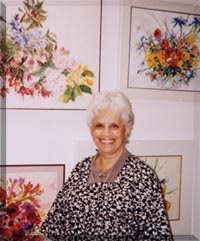 Above: Marty Links circa 1954 from her bio page at Lambiek. 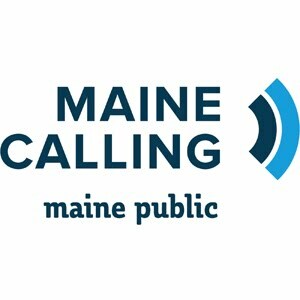 This is the second blog post about Ms. Links. The first one is here. 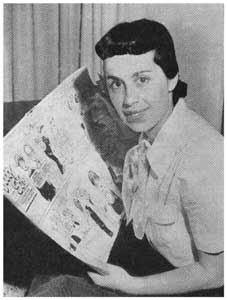 Bobby Sox (later retitled Emmy Lou, after the bobby socks craze was moribund) was the creation of a female cartoonist, Marty Links, who passed away on June 1, 2008. The strip ran from 1944 to 1979. 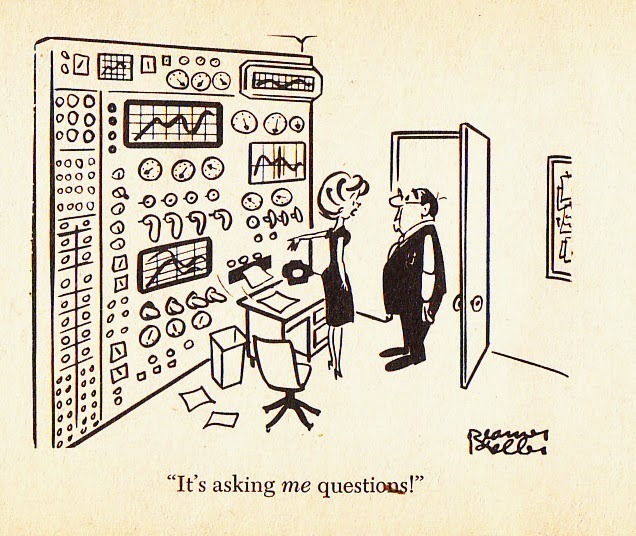 "By the way, if you happen to be confused by the the given name of the cartoonist, you're not alone. 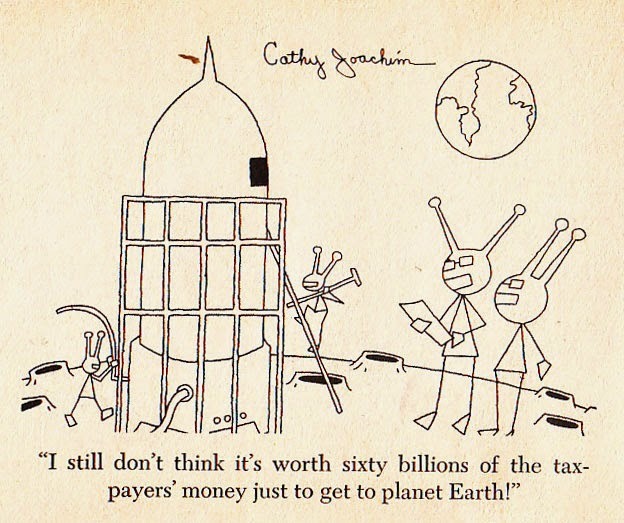 So, apparently, was The National Cartoonists' Society, of which she was one of the first female members. Correspondence from the Society was addressed to 'Mr. Marty Links' even after she'd given birth to her first child. She offered to send them her bust size." Here's a complete interview from CUNY TV's "Day at Night" series, dated May 8, 1974. She draws for us, as well as talks about her process of getting ideas. She also talks about "Sparky" Schulz, who she was close with. 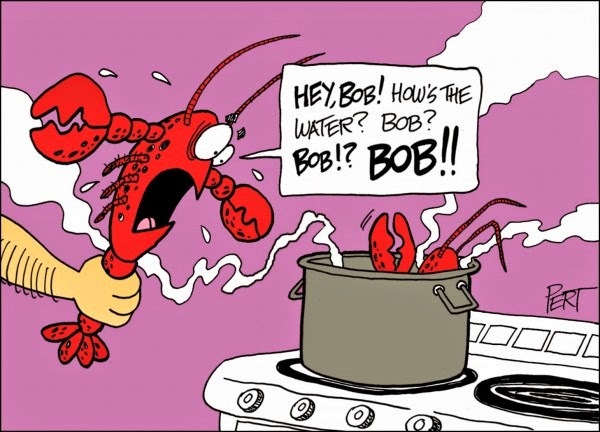 Animator John Kricfalusi has posted a number of Bobby Sox single panel newspaper cartoons at his blog. Go and see! Shaenon K. Garrity has a tribute to Bobby Sox's creator Marty Links here. Photo of Marty Links at left from the Heritage Series site. 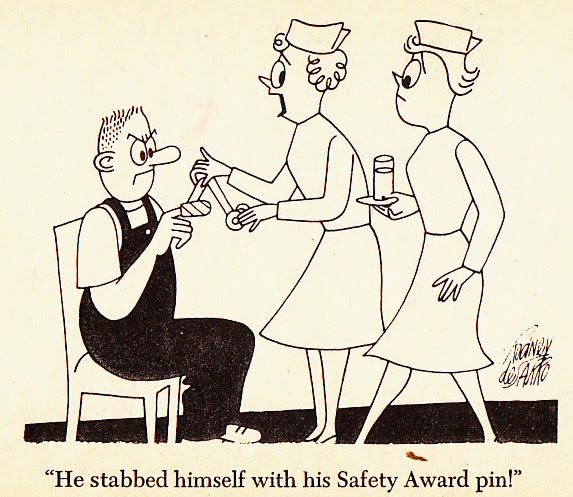 Marty Links drew the panel BOBBY SOX in a specific and graceful way from 1944 to 1979. In 1951, the strip changed its name to EMMY LOU, since the bobby sox fashion had gone the way of the previous generation's fur coat, straw hat and ukulele. Here are a few samples of BOBBY SOX (subtitled THE LIFE AND TIMES OF EMMY LOU) from the Popular Library paperback collection. 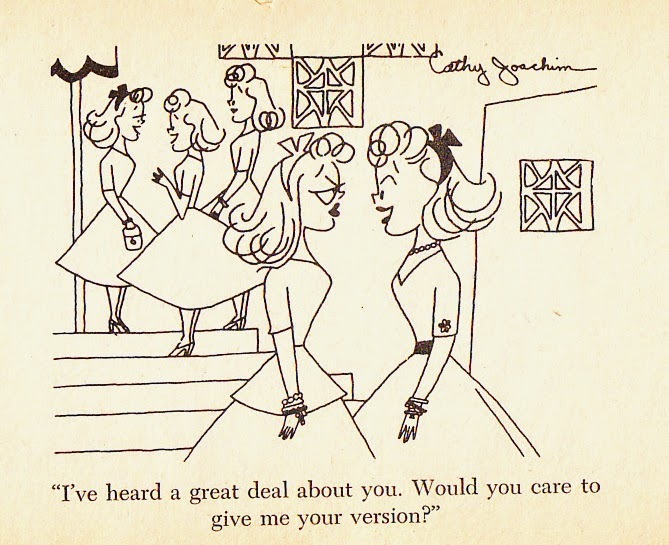 It's copyright 1954 and 1955 by Marty Links. She dedicates it, "To my own future teenagers: Alex, Elizabeth, Victoria." 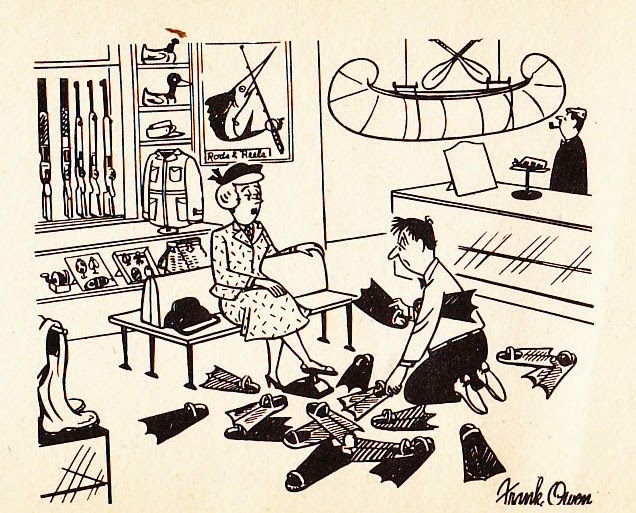 Most of the gags are about concern Emmy Lou's obsessions for boys and shopping. Her boyfriend is Alvin, which is an on again, off again relationship. Above: Link's simple use of black spotting draws our eye to look at Alvin, who has committed the sin of omission to poor gullible Emmy Lou. The thing to watch for, over and over, is the specificity of the clothes, the locations and the people. 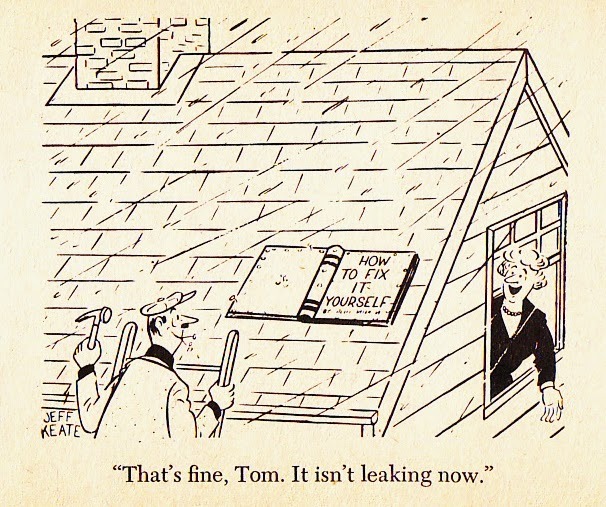 Just look at the awning in the above panel cartoon. It helps frame the picture, it tells us where we are, and Ms. Links adds that unique fringe to it. This all adds to the value of this unique world. All of the kids in BOBBY SOX are lanky and energetic. 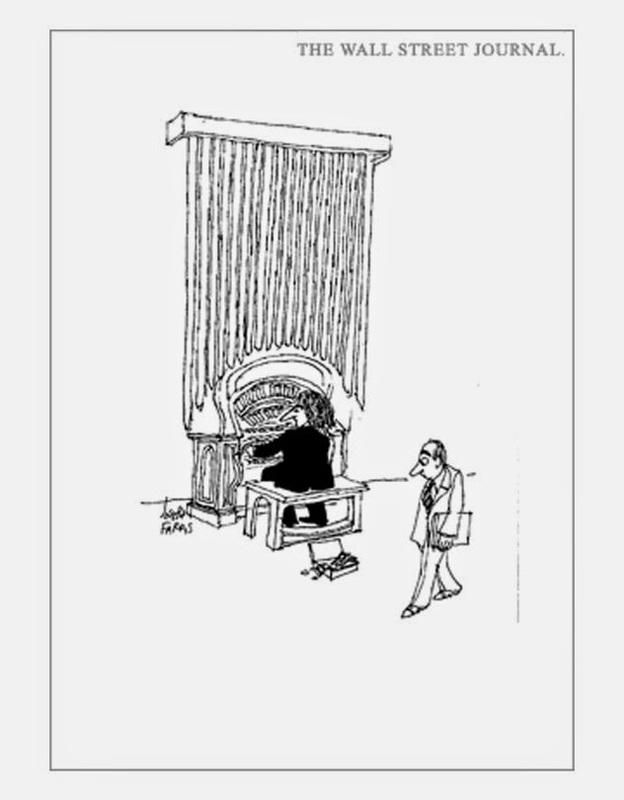 Again: black spotting draws us to the speaker in the cartoon. Another one of the cliches is the gulf of understanding between child and parent. I liked seeing all that pen noodling to make the Christmas tree. Emmy Lou's parents do look a bit like her, but with a doughy addition of a few pounds. The graceful folds in the drapery, the small candle on the table, with its specific holder -- all of these delicate touches add to the authenticity of place. Above: another example of Links' mastery of composition and perspective. As you can see in the blow up of the above cartoon, there's a thin line around the left side of the picket fence and a thick line around the other. A subtle touch to get a feeling of depth that adds to the perspective. In the MERCHANT OF DENNIS book, Hank Ketcham shows us his behind the scenes reference drawings of the interiors of the Mitchell and Wilson homes. These are specific of what the Mitchell doors look like, the Wilson's living room chairs, the kitchen, etc. I can't help but think that Marty Links must have done the same thing for BOBBY SOX. When I bought this paperback collection, I didn't know what to expect. 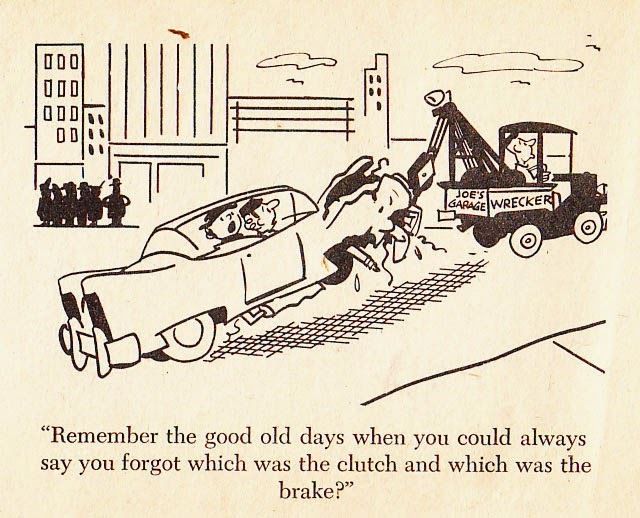 Sure, the jokes have not aged well, but the art is the opposite of the time-worn gags. There's a lot of skilled, knowledgeable drawing to admire in Ms. Links' cartoons. James Van Otto: "I Still Can't Believe It"